Home / Handy Hints / Kitchen / Is Grey the new colour of choice for Kitchens? Published: June 13th, 2018 by Simon. Filed in Kitchen and tagged benchtops, kitchen splashback, tiles. Are you looking to modernise your tired old kitchen? If you are, then you’ve probably noticed that grey is the new colour of choice for kitchens. 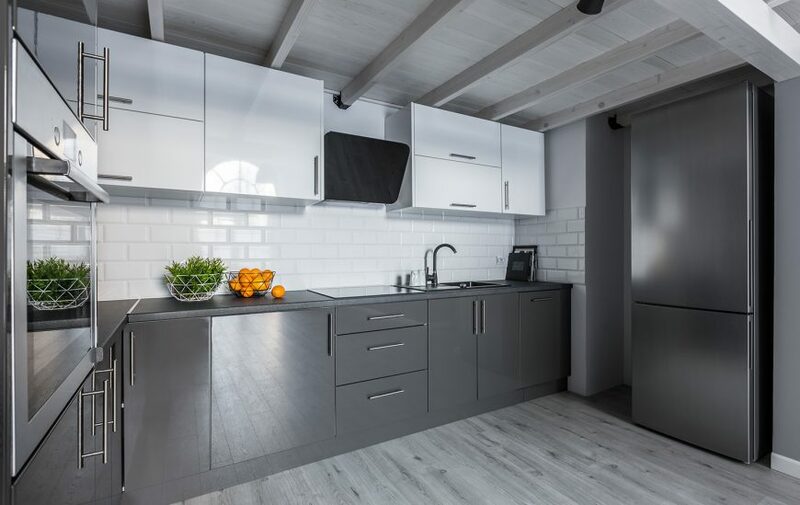 With designer kitchens all over the world adopting the grey look, it’s no surprise that we’re seeing many of our customers looking to create grey kitchens in Perth as well. While grey certainly is trending right now, white remains the most popular colour choice of kitchens. According to Houzz’s 2018 Kitchen Trends Study, 59% of homeowners who renovated their kitchens last year chose white for cabinetry and walls, 37% chose white for their splashbacks, and 32% chose white for their benchtops. It may be some time before white is toppled from being the most popular choice, but grey is strong competition. Houzz reports that grey appears on 22% of benchtops, 16% of walls, 15% of splashbacks and 9% of cabinetry. If you’d like to adopt the grey look, then we have the perfect kitchen products for you at Ross’s Discount Home Centre. Here are ten products from our range of benchtops and splashback tiles that will allow you to create the grey kitchen of your dreams. We offer a full range of stone and laminate benchtops in a range of materials and colour options. Here are 5 of our benchtops which will perfectly complement a grey kitchen. Adopt a dark grey look in your kitchen with our Silver Nube stone benchtop. It features a dark shade of silver with natural patterns and a grainy design. As a stone benchtop, it offers an elegant finish and looks stunning. Its dark silver colour will perfectly complement grey as well as white kitchens. Whether you’re designing a white kitchen or a grey kitchen, you won’t go wrong with our Niebla stone benchtop. This benchtop features a light grey look in a natural stone finish. It allows you to create a refined look, which is the essence of modern kitchens. If you’re looking for a minimalist stone benchtop in grey, you’ll find nothing better than our Kensho benchtop. It comes in a cement grey finish with subtle grains and patterns. This stone benchtop offers a simple, elegant and minimalist look, which makes it perfect for grey kitchens. To create a bold grey kitchen, you need an elegant benchtop with lots of patterns. For this, you’ll find nothing better than our Grey Expo stone benchtop. This benchtop features a dark grey finish with random patterns and colour variations and will help you adopt a stylish look. Our Chrome stone benchtop will allow you to create a modern and very sophisticated grey kitchen. With its chrome look and natural stone finish, this benchtop certainly is trendy and attractive. Whether you’re looking to create a grey kitchen or you need to upgrade, this makes for the perfect benchtop. Now let’s take a look at some splashback tile options. Ross’s Discount Home Centre offers an extensive range of tiles including wall tiles, ceramic tiles, porcelain tiles, marble tiles, mosaic tiles, feature tiles and PVC tiles. Many of our tiles are suitable for creating a grey kitchen. Here are 5 of my personal favourite splashback tiles which are perfect for use in modern grey kitchens. Give your kitchen a bold look with our Chicago Gris feature tile. This feature tile includes a variety of patterned blocks and designs in varying shades of black and grey. Its modern and bold look will transform your kitchen completely. To design a contemporary grey kitchen, our Deco Heritage Mix Black feature tile makes for an excellent choice. It is a feature tile made up of multiple heritage designs in shades of white, grey and black. It offers a refined look and can be paired with modern as well as traditional designs (See my previous post to help with choosing a kitchen design style.). Accessorise your kitchen with our Grenier Black feature tile. Including four heritage designs in shades of white, grey and black, this is a popular tile choice for those wanting to create a grey splashback. It will also complement a wide range of complementary colour schemes. The Brickbold Gris feature tile will give your new kitchen a sleek and minimalistic grey look. It features a brickwork-pattern in different shades of light grey and will allow you to create a sophisticated and modern splashback. Our Atelier feature tile is yet another great choice for creating a grey kitchen. It sports a large heritage design with geometric patterns in shades of white and grey. It is perfect for use in contemporary kitchens as it can be paired with both traditional and modern designs. Grey may be a colour that is trending in kitchens in Perth currently, but white remains the most popular choice. Nevertheless, if you’re looking to stay on trend and adopt a grey look, we have some perfect products for you to consider at Ross’s Discount Home Centre. Our Silver Nube, Niebla, Kensho, Grey Expo and Chrome stone benchtops are perfect for grey kitchens. Also, our Chicago Gris, Deco Heritage Mix Black, Grenier Black, Brickbold Gris and Atelier feature tiles are excellent choices for grey splashbacks. Any of these will help you adopt a gorgeous grey look in your kitchens in Perth. Shop from us online or drop by our showroom in Guildford to buy products for your kitchens in Perth today!